The anthrax bacillus was the first bacterium shown to be the cause of a disease. In 1877, Robert Koch grew it in pure culture, demonstrated its ability to form endospores, and produced experimental anthrax by injecting it into animals. 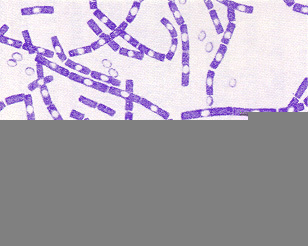 Bacillus anthracis is a very large, Gram positive, sporeforming rod (1-1.5um x 4-10um). The organism is readily cultivated on ordinary nutrient medium and grows best aerobically, but will also multiply under anaerobic conditions. Genotypically and phenotypically, it is very similar to Bacillus cereus, which is isolated readily from soil habitats. However, the natural history of B. anthracis remains obscure. Anthrax is primarily a disease of domesticated and wild animals, particularly herbivorous animals. Humans become infected incidentally when brought into contact with diseased animals, their hides or hair, or their excrement. Many species of animals and birds can acquire the disease naturally. In humans, anthrax is fairly rare; the risk of infection is about 1/100,000. The most common form of the disease in humans is cutaneous anthrax, which is usually acquired via injured skin or mucous membranes. A minor scratch or abrasion, usually on an exposed area of the face or neck or arms, is inoculated by spores from the soil or a contaminated animal or carcass. The spores germinate, vegetative cells multiply, and a characteristic gelatinous edema develops at the site. This develops into papule within 12-36 hrs after infection. The papule changes rapidly to a vesicle, then a pustule (malignant pustule), and finally into a necrotic ulcer from which infection may disseminate, giving rise to septicemia. Lymphatic swelling also occurs within seven days. In severe cases, where the blood stream is eventually invaded, the disease is frequently fatal. Another form of the disease is inhalation anthrax (woolsorters' disease) which results most commonly from inhalation of dust where animal hair or hides are being handled. The disease begins abruptly with high fever and chest pain. It progresses rapidly to a systemic hemorrhagic pathology and is often fatal if treatment cannot stop the invasive aspect of the infection. The toxigenic properties of Bacillus anthracis were not recognized until 1954. Prior to that time, because of the tremendous number of anthrax bacilli observed in the blood of animals dying of the disease (>10^9 bacteria/ml), it was assumed that death was due to blockage of the capillaries, popularly known as the "log-jam" theory. But experimentally it was shown that only about 3 x 10^6 cells/ml are necessary to cause death of the animal. Furthermore, the cell-free plasma of animals dying of anthrax infection contained a toxin which causes symptoms of anthrax when injected into normal guinea pigs. These observations left little doubt that a diffusible exotoxin plays a major role in the pathogenesis of anthrax. One component of the anthrax toxin has a lethal mode of the action that is not understood at this time. Death is apparently due to oxygen depletion, secondary shock, increased vascular permeability, respiratory failure and cardiac failure. Death from anthrax in humans or experimental animals frequently occurs suddenly and unexpectedly. The level of the lethal toxin in the circulation increases rapidly quite late in the disease, and it closely parallels the concentration of organisms in the blood. Bacillus anthracis possesses a unique a cell wall polysaccharide antigen, and forms a single antigenic type of capsule consisting of poly-D-glutamate polypeptide. All virulent B. anthracis form this capsule. Smooth (S) to Rough (R) colonial variants occur, which is correlated with ability to produce the capsule. R variants are relatively avirulent. The poly-D-glutamate capsule is itself nontoxic, but functions to protect the organism against the bactericidal components of serum and phagocytes, and against phagocytic engulfment. The capsule plays its most important role during the establishment of the infection, and a less significant role in the terminal phases of the disease, which are mediated by the anthrax toxin. In addition to the capsule, virulent strains of Bacillus anthracis produce three distinct antigenic components related to a complex exotoxin called the anthrax toxin. Each component of the toxin is a thermolabile protein with a mw of approximately 80kDa. Factor I is the edema factor (EF) which is necessary for the edema producing activity of the toxin. EF is known to be an inherent adenylate cyclase, similar to the Bordetella pertussis adenylate cyclase toxin. Factor II is the protective antigen (PA), because it induces protective antitoxic antibodies in guinea pigs. PA is the binding (B) domain of the anthrax toxin which has two active (A) domains, EF (above) and LF (below). Factor III is known as the lethal factor (LF) because it is essential for the lethal effects of the anthrax toxin. Apart from their antigenicity, each of the three factors exhibits no significant biological activity in an animal. However, combinations of two or three of the toxin components yield the following results in experimental animals. These experiments suggest that the anthrax toxin has the familiar A-B enzymatic-binding structure of bacterial exotoxins with PA acting as the B fragment and either EF or LF acting as the active A fragment. EF+PA has been shown to elevate cyclic AMP to extraordinary levels in susceptible cells. Changes in intracellular cAMP are known to affect changes in membrane permeability and may account for edema. In macrophages and neutrophils an additional effect is the depletion of ATP reserves which are needed for the engulfment process. Hence, one effect of the toxin may be to impair the activity of regional phagocytes during the infectious process . The effects of EF and LF on neutrophils have been studied in some detail. Phagocytosis by opsonized or heat-killed Bacillus anthracis cells is not inhibited by either EF or LF, but a combination of EF + LF inhibits engulfment of the bacteria and the oxidative burst in the pmns. The two toxin components also increased levels of cAMP in the neutrophils. These studies suggest that the two active components of the toxin, EF + LF, together increase host susceptibility to infection by suppressing neutrophil function and impairing host resistance. LF+PA have combined lethal activity as stated above. The lethal factor is a Zn++ dependent protease that induces cytokine production in macrophages and lymphocytes, but its mechanism of cytotoxicity is unknown. Both the capsule and the anthrax toxin may play a role in the early stages of infection, through their direct effects on phagocytes. Virulent anthrax bacilli multiply at the site of the lesion. Phagocytes migrate to the area but the encapsulated organisms can resist phagocytic engulfment, or if engulfed, can resist killing and digestion. A short range effect of the toxin is its further impairment of phagocytic activity and its lethal effect on leukocytes, including phagocytes, at the site. After the organisms and their toxin enter the circulation, the systemic pathology, which may be lethal, will result. Bacillus anthracis coordinates the expression of its virulence factors in response to a specific environmental signal. Anthrax toxin proteins and the antiphagocytic capsule are produced in response to growth in increased atmospheric CO2. This CO2 signal is thought to be of physiological significance for a pathogen which invades mammalian host tissues. Considerable variation in genetic susceptibility to anthrax exists among animal species. Resistant animals fall into two groups: (1) resistant to establishment of anthrax but sensitive to the toxin and (2) resistant to the toxin but susceptible to establishment of disease. This is illustrated in the table below. Animals surviving naturally-acquired anthrax are immune to reinfection. Second attacks are extremely rare. Permanent immunity to anthrax seems to require antibodies to both the toxin and the capsular polypeptide, but the relative importance of the two kinds of antibodies appears to vary widely in different animals. Vaccines composed of killed bacilli and/or capsular antigens produce no significant immunity. A nonencapsulated toxigenic strain has been used effectively in livestock. The Sterne Strain of Bacillus anthracis produces sublethal amounts of the toxin that induce formation of protective antibody. The best vaccine for humans is a preparation of the protective antigen of the lethal toxin recovered from culture filtrates of the bacteria. In either case, frequent boosters are necessary to maintain resistance to anthrax challenge. Recently, the toxin of Bacillus anthracis, specifically its cell-binding domains, has been exploited to transport molecules into selected types of eukaryotic cells, in the search for new vaccines aimed against intracellular parasites. In this case, researchers fused parasite (bacterial or viral) antigens to the anthrax toxin's cell-binding components, thereby creating a model pathogen molecule which is able to recognize and be taken up by T-cells, but which is unable to produce disease. Such types of vaccines are known as intracellular vaccines, and they theortically have the potential to stimulate protective CMI (as opposed to AMI), which is rarely accomplished with most present vaccines. Though still in early stages of testing, the vaccines show promise, and this work may lead to an entirely new class of human vaccines against most viruses, certain bacteria, and parasites. U.S. military forces have been vaccinated recently against anthrax, reflecting the concern about the prospect of anthrax spores being used in defense against them. Iraq, Russia and as many as ten nations have the capability to load spores of B. anthracis into weapons. The spores of B. anthracis can be produced and stored in a dry form and remain viable for decades in storage or after release. When released, the spores are easily dispersed in air for inhalation by unprotected troops (or civilians downwind) and may remain in soil for many years. Anthrax spores are the top choice in biological weapons for "germ warfare". The following is an excerpt from the U.S. Navy Manual on Operational Medicine and Fleet Support, entitled "Biological Warfare Defense Information Sheet". "The disease Anthrax is caused by the bacteria Bacillus anthracis. Anthrax is normally found in sheep, cattle and horses but can be transmitted to humans who contact infected animals or their products. Usually humans acquire the disease by skin contact with the bacteria or by inhaling the bacterial spores found in sheep wool. As an agent of biological warfare (BW), it is expected that a cloud of Anthrax spores would be released at a strategic location to be inhaled by the personnel under attack. As such, the symptoms of Anthrax encountered in BW would follow those expected for inhalation of spores,as opposed to those expected for skin contact or ingestion of the bacteria. These symptoms are discussed in the sections below. Disinfection of contaminated articles may be accomplished using a 0.05% hypochlorite solution (1 tbps. bleach per gallon of water). Spore destruction requires steam sterilization. The military chemical protective mask is effective against inhalation of all Biological Warfare Agents. About 1-6 days after inhaling Bacillus anthracis spores there would be a gradual onset of vague symptoms of illness such as fatigue, fever, mild discomfort in the chest and a possibly a dry cough. The symptoms would improve for a few hours or 2-3 days. Then, there would be sudden onset of difficulty in breathing, profuse sweating, cyanosis (blue colored skin), shock and death in 24-36 hours. These symptoms are essentially those of Woolsorter's disease, which is caused by inhalation of Bacillus anthracis spores rather than contact with the bacterium through the skin. Contact through the skin is the most common "naturally" occurring form of Anthrax and is characterized by swelling and boils on the skin. Skin symptoms would not necessarily be expected with Anthrax resulting from inhaled spores in BW. There is a licensed human Anthrax vaccine that consists of a series of six doses with yearly boosters. The first vaccine of the series must be given at least four weeks before exposure to the disease. This vaccine protects against Anthrax that is acquired through the skin in an occupational environment. It is believed that it would also be effective against inhaled spores in a BW situation. For unvaccinated individuals, antibiotics are given if the individual is exposed to Anthrax. Pencillin is the drug of choice. Antibiotic treatment is known to lessen the severity of the illness in workers who acquire Anthrax through the skin. Inhaled Anthrax was formerly thought to be nearly 100% fatal despite antibiotic treatment, particularly if treatment is started after symptoms appear. A recent Army study resulted in successful treatment of monkeys with antibiotic therapy after being exposed to Anthrax spores. The antibiotic therapy was begun one day after exposure. This study implies antibiotic therapy may be useful in a BW setting if begun soon after the attack. There is no evidence of person-to person transmission of Anthrax. Quarantine of affected individuals is not recommended. Anthrax spores may survive in the soil, water and on surfaces for many years. Spores can only be destroyed by steam sterilization or burning, but not by disinfectants. An infection of local animal populations such as sheep and cattle could follow a biological attack with spores. Infected animals could then transmit the disease to humans through the human's skin, mouth or nose. Veterinarians should be made aware of this possibility. Local health officials should take appropriate measures (published elsewhere) to prevent Anthrax outbreak among animals and an ensuing human epidemic."